Happy Gram - Visit From Australia's Quilted Crow Girl Deidre Bond-Abel! 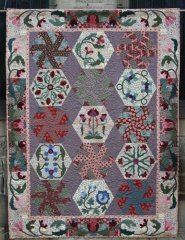 This amazing machine pieced quilt has beautiful wool applique accents. Hexagons For Harriet, by The Quilted Crows of Tazmania, is a new 10 month block of the month program. Finishing 54"x72", this quilt will be a show piece in your home. Only $29.99 a month for ten months, includes the fabric for complete top and binding. Let your eyes take you on a virtual trip to some wonderful shops around the country. Tara Lynn Darr has a collection of of 14 quilts for every skill level. Get out your crayons and join Janet Lindsey in this fun technique class. You will learn how Meg Hawkey of Crabapple creates her wonderful stitching pieces. Class is Wednesday, May 7, 10-2. Two Classes to Play With Jill & Thread! In this fun 2 day class Jill will walk you through Sue Spargo's Creative Stichting book. You'll learn techniques and tips that will help you embellish your favorite projects. Friday, May 9, 10am-1pm and Saturday, May 10, 10am-1pm. Enroll Today! It's a mini retreat for wool! Bring a sack lunch and your wool projects on Saturday, May 17! 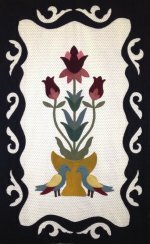 Jill will provide encouragement and guidance on all your wool applique and embellishment projects from 10 a.m. - 5 p.m. Think of that ... an entire day to yourself and your wool projects here in the shop.Register today.